Enter them being my guinea pig subjects for new socks on the market that claim to be the world’s best odorless socks. Full disclosure. These socks were sent to me for testing. I am not paid for the test, nor for my review. The package included two pairs of full socks and one pair of anklets, that I personally tested. MP Magic Socks, as they are called, are made from a unique fabric that uses three metals: silver, copper and zinc. Purportedly, this combo provides antibacterial protection. Now, I’ve never thought about metals protecting my body from odors. Kevlar or other body armor protecting me from violent assault, maybe… but stopping my feet from smelling? Each of these metals individually can impede bacteria and odor, but the combination of the three was first applied in the aerospace industry. 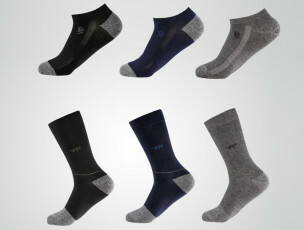 The socks are expected to be breathable and durable. Here’s how our trial went. I wore the ankle socks for two hours of fitness and dance classes. At first I thought the socks a tad large for my feet, but I adjusted them and they stayed put. They are thin, so not as cushioned as others I’ve worn, but they did not slide about, they remained so comfortable that I forgot they were there, and they kept my feet from feeling hot or tight in my sneakers. My husband wore his to work in the yard. As we are in hot-and-humid Florida and he’s been extremely busy cleaning up from the aftermath of Hurricane Irma, his feet got a workout. He reported that his feet didn’t swell from feeling confined, and when he removed the socks, his feet were not smelly. The six-foot 15-year-old was the true test of the socks’ power. His three-hour football practice in the horrendous Florida sun and stickiness made a believer of him and me. He said his feet stayed dry, they didn’t smell or feel sweaty, and when he later washed them (yes, he does his own laundry), they washed well. The company has a Youtube video if you want to see what they say.